The Dangerous Case-of-Donald-Trump-27-Psychiatrists was release on October 3, 2017 and 3 days after this book is temporarily out of stock on bookstores as publishers, St. Martin's Press is scourging to do the reprints. It has a compilation of 27 Mental Health professionals opinions in the American Psychology profession. Whereas, these professionals consensus of the state of the 45th President's mental state posing a threat to him functioning as Commander in Chief. Aided with the assessment of usual patient observation, symptom's and probable diagnostic theories, these health professionals connects the complex to mental illness syndrome. From hedonism, narcissism and impassivity in relation to the different approaches and observed behaviors on the president, these professionals ultimately transfers the final results on diagnosis to the readers. Hence this is because they are constrained by the existing rule of the American Psychiatric Association that inhibits them in getting involved and diagnosing public figures. As any assessment, they simply outline the observed behaviors, patterns, symptoms and connects them with the existing or possible historical complex conditions which may be the condition or illness of a patient. The case brought about by the book centers on the sociopath behaviors seen from the 45th President. As some of the authors cited the fear is that with such conditions like these, it graduates over time and fear of the worse will thus impede the functions of being commander in chief. Although the authors cited the president loves and succeeds in gaining power, it's also an inherent trait of him being a business man, an aggressive one. This is why over and over throughout the book, the writers emphasized it is an assessment and not a diagnosis per se. The contention is that the assessment of being dangerous or dangerousness is very different from a diagnosis. As the book writes on tendencies similar to the recent speech during the United Nations General Assembly when he spoke about the threat to totally destroy an enemy like North Korea, in a body built towards fostering diplomacy among-st nations. Regardless of the different conclusions the readers of the book will arrived to, it is still highly commendable that these psychiatrist had taken courage through this book and their assessments are indeed compelling with the evidence, factors and observations. These writers are aware of their Golden Rule with the APA and understands the impact the information might bring to the reader and the population in general. 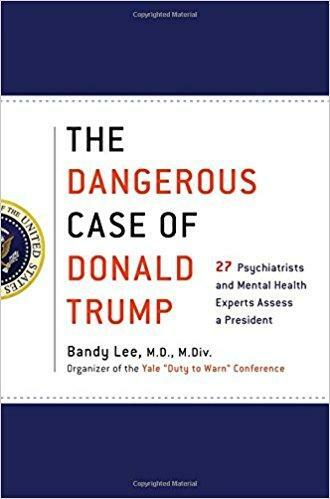 So if you are a dire hard history collector, https://www.usedbooksworld.com/products/the-dangerous-case-of-donald-trump-27-psychiatrists-and-mental-health-experts-assess-a-president-1 will indeed be a good keepsake for the next generation.